Cycling Mont Ventoux, France is top of many people’s must-do list of rides. It’s a giant of a mountain that’s steeped in cycling legend. Bonnieux in the Luberon, Provence for a more all-around holiday experience. 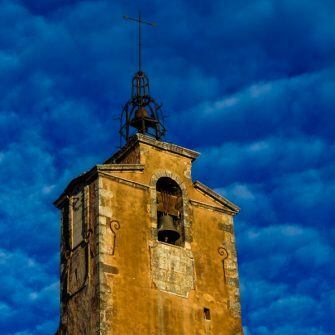 Bédoin is a small, charming town at the base of Mont Ventoux. It has a strong cycling pedigree and lives and breathes cycling during the summer months. Alternatively, base yourself in the Luberon. We think it’s one of the best places to cycle in France. It offers fabulous riding on quiet roads to ancient perched villages, abbeys, castles, lavender fields and vineyards. The terrain is varied, and there are routes that will appeal to all: from flat valley riding to rolling hills. And, for those targeting Mont Ventoux, it’s just around the corner. want to cycle mont ventoux? In this guide, you’ll find detailed information on the routes up Ventoux as well as some awesome rides in the Luberon. We also give accommodation suggestions and bike hire options for Bédoin and the Luberon. Read on for all you need to plan your next cycling adventure. For many cyclists visiting the Luberon and Provence, it’s all about the Mont Ventoux climb. The Giant of Provence, the Bald Mountain, the Lonely Mountain. Whatever you choose to call it, it towers above the Provençal countryside and is one of the world’s most iconic rides. It’s a big part of Tour de France history, books have been written on it, Tom Simpson died cycling it. The weather can be extreme. It is a dangerous, mythical, semi-religious place. It’s a ride every serious road cyclist should do at least once in their life. Granfondo Mont Ventoux. In 2016, the 130km route had an elevation gain of 3,600m. The 78km route had an elevation gain of 2,390m. Les Cinglés du Ventoux. You’ll need to cycle all three routes (up and down) in a day, in whichever order you like. If you complete this, you’ll be doing 72 km of climbing with 4300 meters of vertical gain. Bicinglette - double the Cingles! It requires six ascents and six descents within 24 hours. Are you a member of the Club des Cingles du Mont Ventoux? Let us know in the comments below if you have attempted any of these Mont Ventoux cycling challenges - or if you plan to. We’d love to hear from you. There is another side to cycling in Provence, far away from Mont Ventoux: the less famous, easier going rides through bucolic countryside. The region is a wonderful place to cycle even if you (or someone you’re travelling with) doesn’t want to cycle Mont Ventoux itself. Creamy stone pool villas dot the countryside, there are markets to explore, superb restaurants in quiet villages, excellent little known wine producers, swimming lakes and bike paths for the kids too. 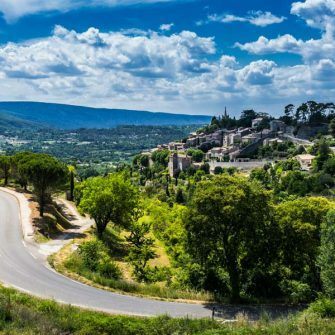 Two of our favourite Provence cycling routes are below. 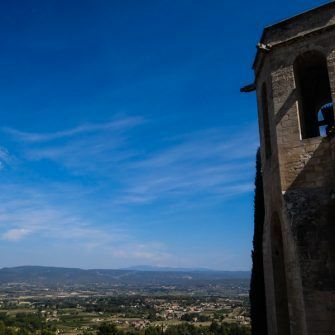 If you’ve only got time for one ride in the Luberon, make it this one; the showcase for Luberon cycling. 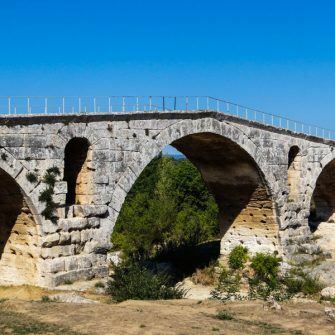 The route takes you past lavender fields, perched villages and some of the region’s most iconic sites, including Chateau de Lacoste, Abbey de Sénanque, Village des Bories and Le Sentier des Ocres in Roussillon. The real difficulty will be resisting the urge to stop all the time to take photos and visit these amazing places. Tip: If you’re looking for a longer ride, tack on the 38km perched village ride. This fabulous loop gives you a taste of the Luberon on the south side of the Luberon Mountains. The ride starts with the unforgettable twisting and turning descent of the D943 gorge road, surrounded by immense grey stone walls. Once you’re out of the gorge, the riding is more mellow through vineyards, past castles and through ancient villages. The small lake surrounded by 200-year-old plane trees at Cucuron is a particular highlight. 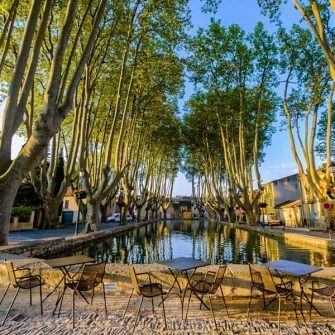 If you’ve got time, we’d also recommend a stop in beautiful Lourmarin. 236 km loop of the Luberon: map here, GPX file here. 41 or 91 km loop of the southern Luberon: map here, GPX file here. 51 km loop of the ochre landscapes of the Luberon: map here, GPX file here. 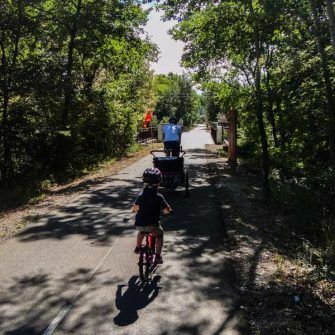 A superb bike path begins near the village of Coustellet and follows the Calavon valley for 37km. It’s almost flat (189m elevation gain over the whole ride), and much is well away from the road. One of the highlights is passing the Pont Julian Roman bridge. Lacoste with its wonderful castle and panoramas over the Luberon. Menerbes, one of the Luberon’s most famous perched villages. 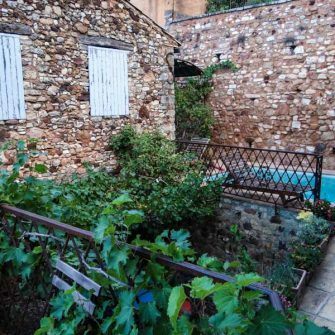 Oppède le Vieux, this once abandoned terraced village is one of our favourite finds. An old gateway leads from the main square to the upper village - be prepared for countless steps and unforgettable views from the church at the top. You’ll need to leave your bikes at the bottom. Tip: with 634m climbing, this route is only suitable for older children that are keen cyclists. We have included details of what hotels have told us about bike storage facilities. Please check that these policies haven’t changed when you book. If your sole focus is Ventoux and you want to ride it multiple times, you’ll want to consider hotels near Mont Ventoux. Staying in or around Bédoin will give you easy access. 5 star hotel about 4.5km west of Bédoin with views towards Ventoux. 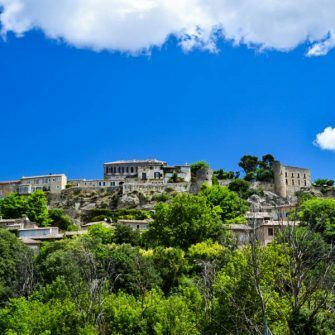 It’s a private eight building village, within the historic village of Crillon le Brave. Two restaurants - the main restaurant (either in the vaulted dining room or on the terrace) and a bistro (most nights in summer). Heated swimming pool (6m x 11m) with a quiet time (3-6pm), plus a jacuzzi and spa. Trek hybrid bicycles available to borrow. Boules court and nearby tennis court. Parking in village or, by prior arrangement, garage parking. Four star, impressive Regency villa, located in the centre of the small town of Mazan, about 10km south of Bédoin. Stylishly decorated with antiques, art and interesting objects d'art. For families, there are a couple of suites with sofa beds or, in the house opposite the chateau, you can book two adjoining rooms. Landscaped garden and a swimming pool with sun loungers. Bike facilities: “we have a secure bike storage available for guests”. 2km outside Bédoin town centre. Contemporary furnishings and sleek, modern bathrooms. Lots of facilities including on-site restaurant, bar and lounge. Outside there’s a terrace, good sized swimming pool and a garden with hammocks under the pine trees. There’s also a massage centre, table tennis and boules. Bike facilities: bike storage in a locked garage. In a small village 4km outside Bédoin town centre on the road to Ventoux, with great views of the mountain. Clean, simple rooms with traditional furnishings. Family rooms are available. A couple of restaurants within a short walk. Guests praise the warm welcome and good customer service. 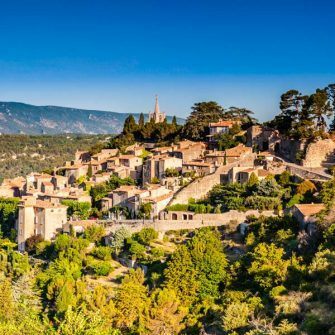 If you’re looking for a more all-around holiday destination and are just planning to ride Ventoux as a one-off, we’d suggest staying in the wonderful Luberon National Park. We think it’s the best base for cycling in Provence and it gives easy access to Ventoux. Depending on where you stay, it’s around 35-40km south of Bédoin. 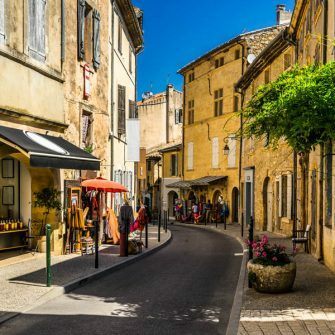 Our favourite town in the Luberon is Bonnieux, because of its commanding position, winding streets and superb restaurants. Gordes and Roussillon - perched towns that retain their elegance and charm despite being quite touristy. Gordes is unforgettable due to the craggy outcrop it straddles, and Roussillon is famous for its ochre cliffs. If you arrive at the start or end of each day, you’ll avoid seeing too many other tourists. It’s difficult to stop yourself falling in love with these charming little towns. Lourmarin - it’s a bit further from here to Ventoux, but it’s a gorgeous golden town full of boutique shops and amazing restaurants. It’s also home to Peter Mayle of A Year in Provence fame. Read on for Luberon villa and hotel suggestions! 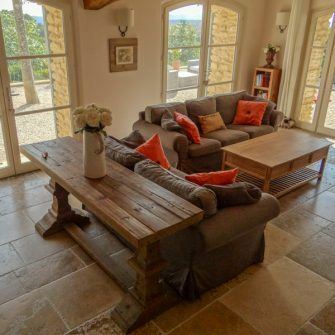 We have stayed in three different villas in the Luberon. All were gorgeous, and we would happily recommend them to friends. 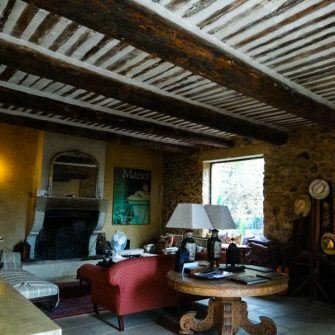 Pretty two bedroom, two bathroom first-floor apartment in an 18th century Provençal farmhouse, between Bonnieux and Lacoste. Provençal chic style with white walls, high ceilings and pretty details such as Toile de Jouy bedspreads, wrought iron bedheads and fresh flowers. Wonderful shaded garden next to the heated swimming pool. 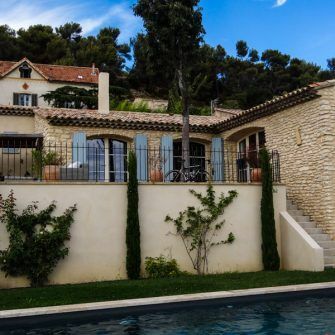 The attractive pool area has sun loungers and views to Bonnieux and Lacoste. Kind, English hosts live in the attached farmhouse and are on hand should you need them. 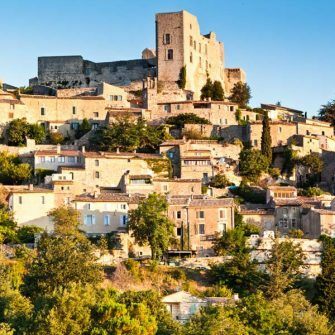 Close to two of the loveliest towns in the Luberon: Bonnieux and Lacoste. The house is on a quiet country road which has very little traffic. However, if you’re outside when a car comes past you notice it because the house is close to the road. 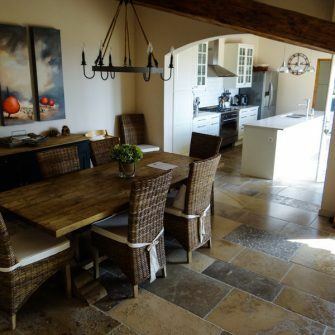 This beautifully furnished old house has a fabulous town centre location. The house is 50m from the market square. It feels very special to amble to the boulangerie in the morning and wander home after a wonderful evening meal, when the tourists have gone home, and the quiet streets are your own. Unusually for a town centre house, there’s a pretty garden area with a vine-covered ground floor terrace, an upper terrace with beautiful panoramic views across the hills and a small swimming pool. It feels like you’re staying at a wealthy friend’s much-loved home (but with just their nicest things on display!). It is tastefully personalised with antiques and artwork and has a lovely warm atmosphere. 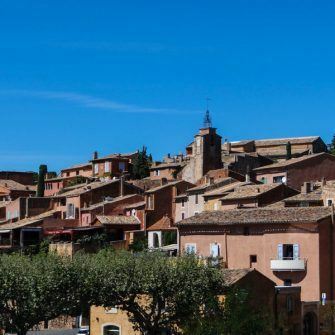 Roussillon is a great spot from which to explore the Luberon. Parking is in the public car park just up the hill at the top of town. A car parking permit is provided. The owners live in the UK but are very communicative and helpful if you need any assistance. Being in a small village (with restaurant, café/pizzeria and shop that also sells fresh bread for your breakfast) but close to the pretty town of Lourmarin. The house is nicely decorated with smart, modern furnishings. It’s recently built, but in a traditional style. The enormous rounded terrace doors in the living area, creamy stone finishings and traditional blue shutters make the house feel solid and well built. The main living space is one large L-shape, which is great for socialising and a holiday atmosphere. Wonderful outside area, with fabulous unrestricted views over countryside to the mountains. There is comfortable seating, a shaded eight-person dining table, gas BBQ and a fabulous heated swimming pool with pool loungers. 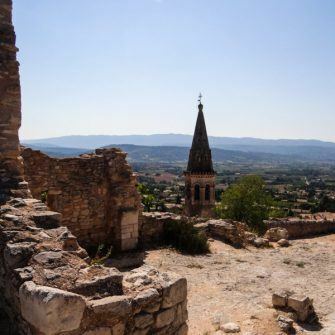 The opportunity to explore the quieter south side of the Luberon, while still being close enough to visit the beautiful towns on the north side. The owners live in Canada but have a local agent who is on hand to help. 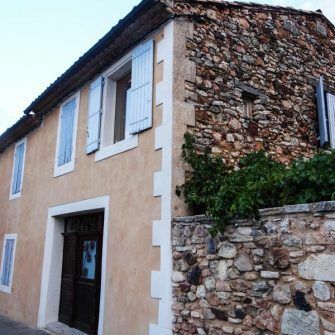 Our next cycling trip to the Luberon will definitely incorporate a stay at the Coquillade Village in Gargas. 5 star hotel perched on a hill, surrounded by Provençal countryside. It’s owned by Swiss billionaire Andy Rihs, of BMC Racing Team fame. Elegant rooms with country-chic Provençal décor are found in renovated ancient country houses and ochre cottages. The hotel includes the BMC Cycling Center, a 200m² showroom where you can rent all sorts of bikes including top-end road bikes. The hotel has excellent family friendly credentials with a kids club, kids bike hire and a whole host of sports facilities including state of the art gym and fitness room, tennis, petanque, foosball, ping-pong table, swimming, tennis and introduction to golf. We have listed below some companies that should be able to help with bike rental for Mont Ventoux and the wider Luberon/Provence region. We have always taken our bikes with us, so haven’t tried these suggestions. 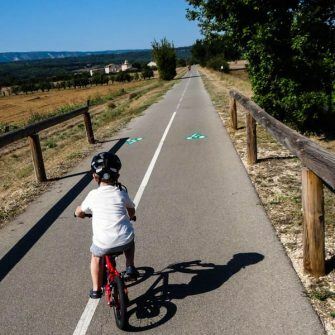 La Route du Ventoux is also known as France Bike Rentals as the owners of La Route du Ventoux are part owners of France Bike Rentals, a company which rents and delivers bikes all over France. There are lots of places to rent bikes in the Luberon and Provence and we’ve listed some below. 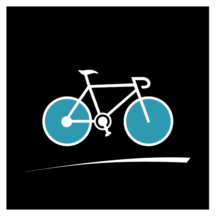 You need to contact them about road bike hire since they primarily rent electric bikes. Book your bike in advance, particularly in peak season when Ventoux bike rental can get super busy. Remember to bring your own pedals, shoes and helmet. This ​packing list may help! Check which way around your brakes are set before you ride away (i.e. whether the front brakes are on the right hand (as is usual in the UK) or on the left (as is usual elsewhere in Europe). 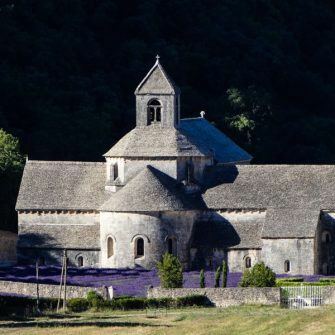 Our favourite time to visit the Luberon and Ventoux is June when it’s hot, without being ridiculous, the lavender fields look and smell amazing, and the roads aren’t inundated with families on school holidays. That said, we’ve visited in July and (contrary to what most people say!) preferred it to September simply due to the lavender fields being in flower and the reliably hot days. It comes down to your priorities. Hopefully, this chart will help you decide. The weather on Ventoux is changeable whatever the time of year and the Mistral may well be blowing hard - even in high summer. If you want to cycle Ventoux, check the Mont Ventoux weather forecast before you set out. Ventoux may be closed, depending on weather and which route you want to ride. May still be a bit of snow at the top of Ventoux and unlikely to see the lavender fields in bloom. But tourist numbers should be low, and the heat shouldn’t be too intense. Warm days for cycling, without the intense heat of July/August, fewer tourists and, in late June, the lavender fields should be in bloom. School holidays in France, UK (from mid-July) and US; Le Festival d’Avignon makes the area particularly busy; and it could be very hot. But you should see lavender and sunflowers in full bloom. School holidays in France, UK and US; intense heat will make Ventoux hard work. But you should see lavender and sunflowers (lavender is generally harvested from mid-July to late August). Can get some heavy rain/thunderstorms and the lavender will have been harvested but generally a good combination of lower temperature and fewer tourists. Great for foodies: markets packed with ripe produce, e.g. Cavaillon melons. Earlier on in October, you may well have good temperatures and clear roads for climbing Ventoux. Towards the middle and end of the month, the road may be shut depending on weather and route. Ventoux may well be closed, depending on weather and which route you want to ride. If you like to look at bike routes on a physical map, consider this map of the Vaucluse department (which is where the Luberon and Ventoux are located). The IGN Ventoux map may also be useful. Daniel Friebe’s coffee table sized Mountain High is an excellent addition to any cycling library. It covers a selection of Europe’s greatest climbs, including Mont Ventoux. It has four pages of the cycling history of Ventoux as well as good photos and profiles of the Bédoin and Malaucène routes. Alternatively, Simon Warren’s (almost) pocket-sized 100 Greatest Cycling Climbs Tour de France gives a brief but practical description of Ventoux. Ride a Stage of the Tour de France by Kristian Bauer is in a similar vein. It is a translation from the German original published in 2006, but don’t let that put you off. It’s in a slightly larger format than Warren’s book, and so has more room for detail. It includes ten pages on Ventoux, covering the Bédoin and Malaucène routes, and including maps, profiles, photos and history. Tom Simpson and Mont Ventoux are practically synonymous. His death on Ventoux is a prominent part of the mountain’s history. These books will fill you in. Put Me Back On My Bike: In Search of Tom Simpson by William Fotheringham. Cycling is my life, Tom Simpson's autobiography. Mr Tom: The True Story of Tom Simpson by Simpson's nephew, the cycling author Chris Sidwells. DVDs of Tour de France highlights will of course feature Ventoux. There is also Virtual Rides Ventoux Cycling Training if you want to have Ventoux as your backdrop as you train for your ride. 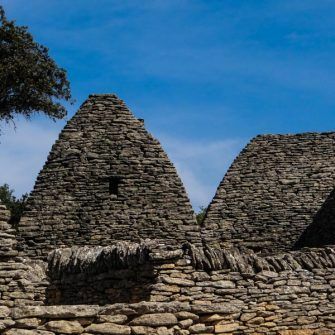 If you're looking for inspiration for what to do when you're not cycling, this helpful article gives you 7 days of things to do and see in Provence. Want a jersey to commemorate (or motivate) your climb up Mont Ventoux? Check this out. The Tour de France does not visit Ventoux very often; the 2016 tour was its 15th visit and 10th stage finish. All but 1 of these visits has used the Bédoin route. The exception was in 1951 when the Tour climbed from Malaucène. Britain’s Tom Simpson died on Mont Ventoux on July 13, 1967, during the Tour de France. Exhausted and dehydrated, he collapsed near the top of the climb. In a state of delirium, he was heard to utter “Put me back on my bike!” Sadly he died on the way to hospital. Alcohol and amphetamines were found in his blood. Thousands visit the memorial to Simpson on Ventoux each year. He was 29 and the first British rider to have a genuine chance of winning the Tour. In 2016, a motorcycle-induced crash damaged Chris Froome’s bike. He ended up running about 100m up the mountain until he was given a neutral service bike (his team car was too far back). In 2000, Armstrong said he gifted Pantani the win after the pair broke away together to the top of Ventoux. Pantani was suitably miffed, and a famous war of words ensued. Armstrong never won on Ventoux. Ventoux is French for ‘wind’. Wind speeds as high as 320 km/h have been recorded, and the wind blows at 90+ km/hour for over 200 days a year. As a result, temperatures on Mont Ventoux can be as extreme. For more information read our tips on cycling Mont Ventoux article. The altitude of Mont Ventoux seems to be open to debate. You’ll see a range of heights for its summit - anything from 1,909 metres to 1,912 metres. UNESCO list Ventoux as a biosphere reserve. For information on the Cingles Ventoux challenge, see above. The fastest ascent of Mont Ventoux to date was Iban Mayo’s record Mont Ventoux climb of 55' 51" in the individual climbing time trial of the 2004 Dauphiné Libéré. The average time for cycling Mont Ventoux is a more moderate 1.5 to 4 hours, depending on which route you take, your fitness and the conditions. We hope you’ve enjoyed our guide to the Ventoux and Luberon/Provence region. Drop us a line or let us know your thoughts in the comments below. Want to check out some other destinations? Search for more amazing cycling destinations and if you know when you want to travel, speed up the decision process by filtering by the month you want to travel. Our complete guide to cycling Mont Ventoux from Malaucène. Don't miss our inspirational photos plus route map, profile, GPX and more. Our comprehensive guide to cycling Mont Ventoux from Sault. We give inspiration and practical information to help you have an awesome ride. Don't cycle Mont Ventoux from Bédoin without having read this first! Get the inspiration and information you need to tackle this infamous route. Our best tips on how to make your ride up Ventoux a success, including how to prepare and plan for Ventoux's notorious weather. We visited the Luberon for the second time this summer and found the Epic Road Rides site very useful indeed. From the recommended rides, including GPX routes to download, places to stay and the useful packing list, an excellent one stop shop for planning your cycling holiday! Thanks for your kind words and glad to hear you found the information useful. The Luberon is an amazing place to ride; hope you had a fantastic holiday!